Paint a rock; Hide a rock; Spread smiles. Tuesday is “Paint-a-Rock, Hide-a-Rock” Day. OHIO VALLEY — When it seems like there is so much evil in the world, a group that started in western West Virginia is doing their part to make a difference. Kathy Cobb, from Ashton, West Virginia, started painting rocks and placing them around her community to spread a few smiles. In January 2017, she made a Facebook group called Western WV Rocks. The group has grown to over 32,000 members. Cobb creates monthly and daily challenges to encourage members to keep painting rocks. These challenges are themes, such as movie characters, that members can paint and share their pictures on the Facebook page. The current theme is a little different than the typical daily challenge. 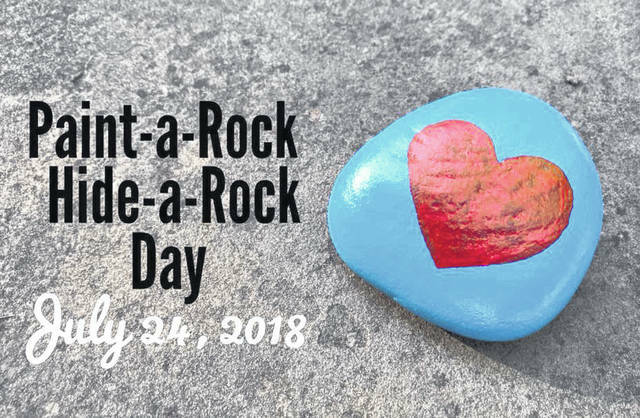 Members are encouraged to paint rocks blue with a red heart in the middle. The blue represents the world we live in and the red heart represents the love we share when we brighten someone’s day. On Tuesday, July 24, there is a “rock drop” planned for these blue rocks. After painting a kindness rock, they place them throughout their communities. When the rocks are found, that person is supposed to take the rock and hide it again. Members of the Western WV group place a tag with the name of the group on the back of the rocks they paint. Whoever finds the rock can go back to the Facebook page and let them know where they found the rock. According to Cobb, these tags have allowed her to keep track of rocks that have been taken to almost every state in the country as well as other countries, such as Germany, France, Mexico, Canada, many others. Several members of the group take their rocks on vacations and give them to people they meet along the way. Cobb said it is important to her that her Facebook group is G rated. She wants someone to look through the pictures with their children and no worry about what they might see. This small, simple act of kindness was created to spread smiles. “This world is filled with enough bad,” said Cobb. She encourages you to participate in the rock drop Tuesday and to paint a rock, hide a rock, and spread smiles.